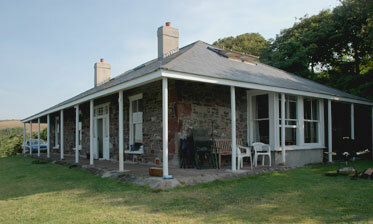 The accommodation consists of two parts: The Bungalow and Joan's Cottage. There is an adjoining door linking Joan's cottage to the Bungalow. 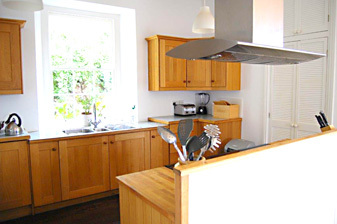 Both parts have full central heating and modern kitchens and bathrooms. 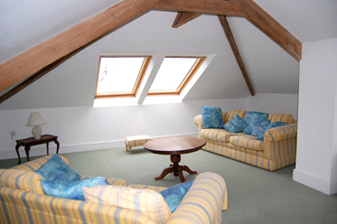 The downstairs rooms in both parts have high ceilings but the upstairs in the cottage has limited headroom - about 5'8''. Please click on the link to view Joan's cottage. Kitchen, Dining room, Lounge. 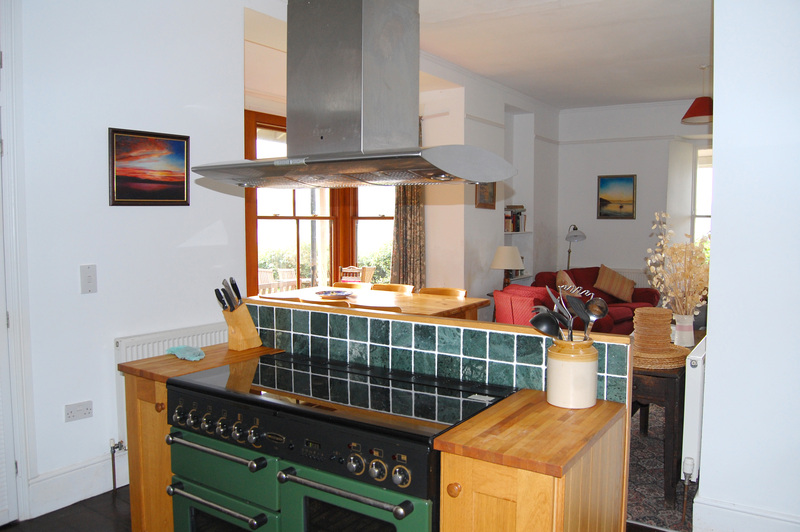 High quality kitchen with Rangemaster (gas hob, double electric oven), dishwasher, large fridge, freezer and microwave. 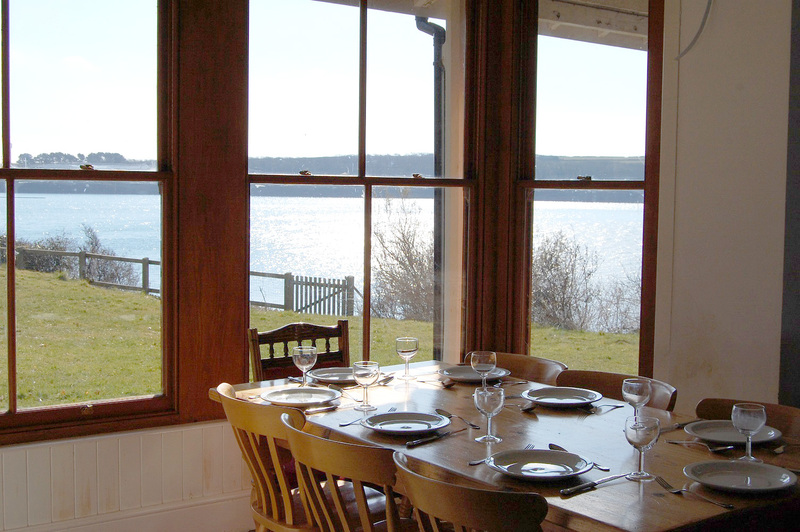 Dining table in large bay window with superb sea views. 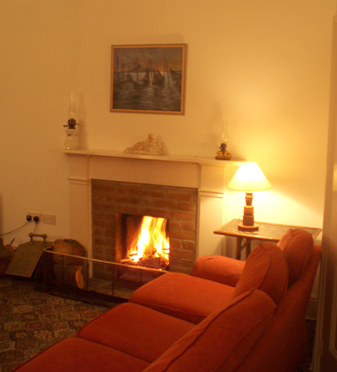 Two settees, two armchairs, open fire, (This room works brilliantly as the main social gathering area; there are other lounge areas for those who need quieter surroundings). TV and DVD are available. Bedroom 1 - Double bed, wash-basin. Views from the front of the house across the bay. Bedroom 2 - Double bed, en-suite wash-basin and electric shower. Views from the front of the house across the bay. Bedroom 3 - Single bed, washbasin. View up to the top of the bay. Bathroom. Newly fitted with bath, shower, basin. toilet. (Hot water supplied from large boiler in utility next door). Large sitting room - Two settees and a double sofa bed. Views through large double Velux to open sea. 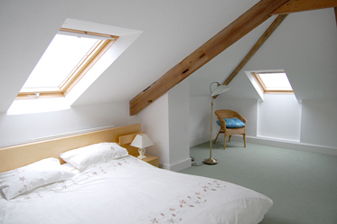 Bedroom - Double bed, en-suite bathroom with bath, shower over bath, basin and toilet.